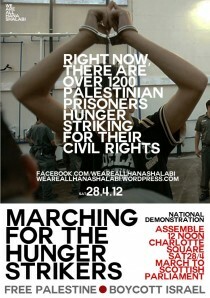 March – Solidarity with the Palestinian Hunger Strikers!Free Palestine! Boycott Israel! ASSEMBLE 12 Noon at Charlotte Square to March to the Scottish Parliament. In Glasgow, hundreds of people have demonstrated at the BBC Scotland HQ protesting the media blackout on the continuing situation with the prisoners. The building was also occupied by protesters as mainstream media institutions are highlighting their complicity in Israel’s crimes through their silence on the issue. 1) Issue a statement supporting the mass hunger strike, calling for the immediate release of Palestinians held in detention without charge and condemning Israel’s inhumane treatment of Palestinian political prisoners. Transport is currently being arranged from Glasgow and elsewhere to check this event for updates on that. 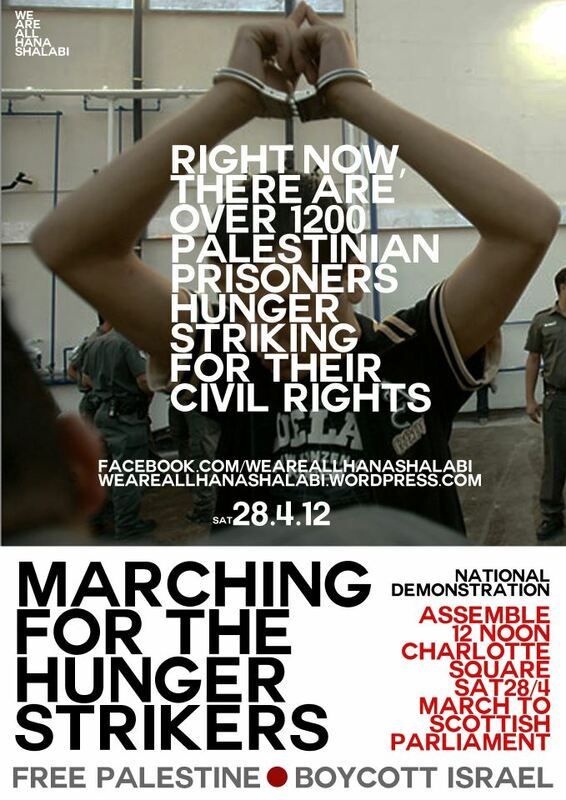 This entry was posted in Edinburgh, Events, Prisoners and tagged Demo, Edinburgh, Prisoners. Bookmark the permalink.